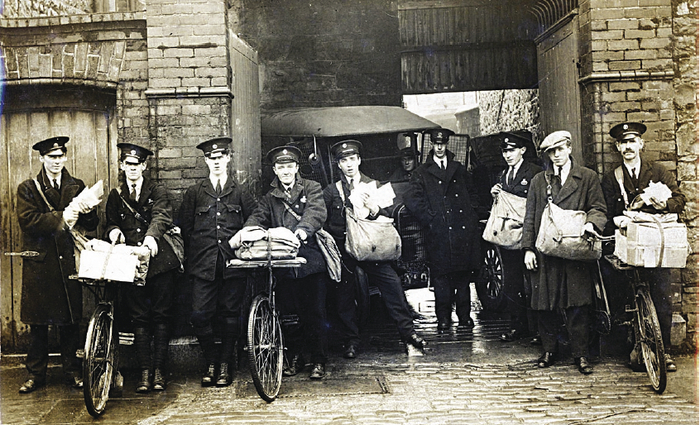 The postmen are, left to right: Frank Kavanagh, Fairhill; Miko O’Halloran, St Vincent’s Avenue; Ossie O’Connell, Prospect Hill; Sam McGowan, Bushypark; PC Kelly, Arch House (next to the Spanish Arch); Jim ‘Mater’ Kelly, Newcastle; Jack Berry, St John’s Terrace; John Clancy, Raleigh Row; Joe Crowley, Bohermore; and John Woods, Whitehall. This photograph of a group of postmen was taken on December 17 1928 outside the General Post Office in Eglinton Street. The sorting office was inside the double gate, as was the long narrow passage that brought one into the back of the post office. The car in the background was a Model T. Notice the cobbled footpath. The postmen are, left to right: Frank Kavanagh, Fairhill; Miko O’Halloran, St Vincent’s Avenue; Ossie O’Connell, Prospect Hill; Sam McGowan, Bushypark; PC Kelly, Arch House (next to the Spanish Arch ); Jim ‘Mater’ Kelly, Newcastle; Jack Berry, St John’s Terrace; John Clancy, Raleigh Row; Joe Crowley, Bohermore; and John Woods, Whitehall. The postal and the telegram systems were the main types of distance communications used in Galway until 1892 when a Mr Dudgeon of the Dublin Telephone Company asked the Urban District Council for permission to erect telephone poles from the proposed telephone exchange in Galway. The council agreed, and so the telephone came to the city. It did not really catch on at first, the town commissioners themselves did not subscribe until almost six years after the exchange was set up, and businesses were slow to recognise the potential of this form of communication for sales and services. The rental at the time was £7 per annum. Your phone came with a device with a handle which you would wind several times to get through to the exchange. You gave the operator your number and told him/her the number you wanted and he/she connected you. There was often the suspicion that the operator was listening in to your call. The exchange was at the corner of Daly’s Place and St Francis Street (where Emerson & Conway is today ), and the phone number there was Galway 20. In 1913 the town commissioner’s number was Galway 2; John Whelan, chemist, Williamsgate Street, had number 12; Galway 5 was for postal facilities; you rang 22 if you were looking for Queen’s College; 9 was Thomas McDonagh’s number; 13 for the Midland Great Western Railway Company; 37 for the officer commanding the Connaught Rangers; the Congested Districts Board in St Francis Street was 42; The Galway Electric Company, 36; Simmon’s Motor Garage of William Street, 18; James Behan, coal merchant, carrier, 30; and PJ Hannon, guano and corn merchants, St Augustine Street, 19. If you wanted the post office in Salthill, you asked for Salthill 10; Salthill 3 was Mr Hynes, timber merchant at Blackrock House; Miss Galbraith of Daly’s Fort was Salthill 7; W Connolly, Knocknacarra, was Salthill 6; PJ Boland of Glenarde House was Salthill 2; Henry Chevalier Rigand, a retired naval captain who lived in The Croft, was Salthill 5; Dr WA Sandys of the Crescent was Salthill 4; and Lt Col James O’Hara of Lenaboy was Salthill 8. The complete directory of the day for Galway and Salthill was roughly twice as long as the above list. The post office took over the telephone company in 1912, and it had a monopoly for many years thereafter. This caused major problems in 1977 when a prolonged telephone strike caused almost half the city’s 6,500 phones, including kiosks, to cease working. Our thanks to Oliver Muldoon for much of the above information.